Triangle Collision is a member of the Assured Performance Network, meaning we deliver Certified Hyundai repairs. This way you can feel confident that your Hyundai will be restored to pre-accident condition, guaranteed. Our mission is to make the repair process as painless as possible. Not only will we restore your vehicle, but your peace of mind as well. We offer 24/7 and rental car assistance, and take the hassle out of the insurance claim process. If you live in the Morrisville or Cary area and have a Hyundai that was involved in an accident, contact Triangle Collision at (919) 460-7693 or click here to contact us online! We stand behind our collision repair with Lifetime Warranties for many of our services. Our factory certified technicians know the unique needs of your Hyundai and only follow manufacturer guidelines when preforming repairs. We strive to build long lasting relationships with our customers. We handle every vehicle with personalized care, and never hide information from our customers. It is our job to repair your vehicle to the way it was prior to the accident. Many shops will cut corners while trying to cycle through as many customers as possible. We understand that a safe repair can only be achieved by sticking to the factory guidelines for Hyundai repair. It’s your choice, not the insurance companies, where your vehicle is repaired. 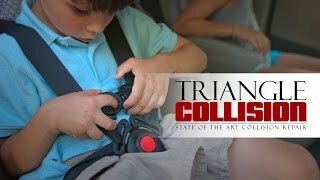 Choose Triangle Collision, the Cary, NC area’s premiere Certified Hyundai Body Shop & Collision Center. As a member of the Assured Performance Network our facility is guaranteed to have the technicians and equipment necessary to restore your Hyundai to like-new condition. As Hyundai vehicles achieve more advanced designs with more state-of-the-art technology, we need to continue to train to know how to repair these new features. Not only is this vital to the safety and performance of your Hyundai, but the value of your investment as well. By using genuine repair procedures, accompanied by genuine Hyundai parts, it will be as if the collision never happened. Not only will this restore your resale value, but it can also keep factory warranties valid. Modern Hyundai vehicles are built with safety in mind. During a collision the vehicle is designed to react in a very specific way in order to best protect the passengers. Air bags are calibrated to take into account details such as the passengers weight, and structural components deconstruct in carefully plotted ways to deflect the impact away from passengers. Repairing these advanced components require the same attention to detail and quality that they would receive in the factory. This is why Triangle always follows factory Hyundai repair guidelines. The safety of our customers is always our number one priority. We have partnered with Lemon’s Wrecker Service in order to provide 24/7 towing for our customers. By taking advantage of our partnership your transportation costs will be wrapped into final total which is much easier to cover with an insurance policy. Dealing with a claim is additional stress that you do not need after a collision. We take that weight off your shoulders and deal with the insurance company for you. We know how to make sure that your vehicle is returned to pre-accident condition; both in the shop, and during the claims process. Our shop is equipped with BASF refinishing technology. BASF is the industry standard for paint repair and is guaranteed to match your Hyundai’s original color. By having this all in one convenient location you will not have to worry about transporting your vehicle before it is fully repaired.